It’s been established in previous strips that the Cornfather does kid parties on occasion, only, the costumes weren’t so horrifying in previous installments (JEFbot.21). And since we’re on the subject of Star Wars, it can certainly be argued that Anakin was even more annoying than Jar Jar Binks in Episodes I, II and III, but nothing quite symbolizes how the prequels went wrong like Jar Jar. Especially for people from my generation that loved the Original Trilogy so enthusiastically. OUTSTANDING! Meesa loving this strip sooooo much right now! ha! thanks, Funnyshaffer. yousa awesome! to do that you would need to get in a long, long, long line of jar jar haters, jf#300. i’m talkin a lOOoOOoong line. Prequels? Hmmm…I remember “Star Wars”, “Empire Strikes Back”, and “Return of the Jedi”, but that’s it. Make it a 3fer cause REALLY?! In this instance, denial is my friend. i’m trying to deny the existence of the prequels, Jeff, but the power of the Dark Side (namely, George Lucas) is strong. deep breaths, t_d! DEEP BREATHS!!! Luck in Vegas! Break a bank! *had me laughing is the proper sentence I was attempting to type out, but I’m still so tired my brain is frazzled. thanks, Spanks! glad you got a laugh from this one. and yes, every time i watch the prequels, both young “Annie” and teen Anakin get more and more annoying. but i still want to hit Jar Jar in the face whenever i see him. Original Trilogy, FTW!!! I have never seen all of star wars, I KNOW don’t look at me like that, but I don’t understand all the hate for Jar Jar I think he’s adorable. This lack of understanding can only be because you haven’t seen all of it, DJ. Ack! I wanted to smack JarJar. Just like everyone else who was over 10 who saw the movies. -looks it up- 1999 nope I was 9 years old when it came out. as far as thinking Jar Jar’s adorable – Shanna’s right. most people i know who were kids when the prequels came out don’t have the same hatred for him as us old fogies. i know kids that absolutely love him, so i won’t hold it against you, since you’re young. but you’ve got to see the original trilogy immediately. I want to read the book before watching A Clockwork Orange because I heard it was different than the movie. My roommate tried to get me to watch all of the LoTR movies too. I’ve seen the first one but never made it through any of the others. She has also said that she is going to sit me down and force me to watch them. I have seen Eps 1 and 2 but those don’t count acceding to most people. sorry for the tears, TCG. 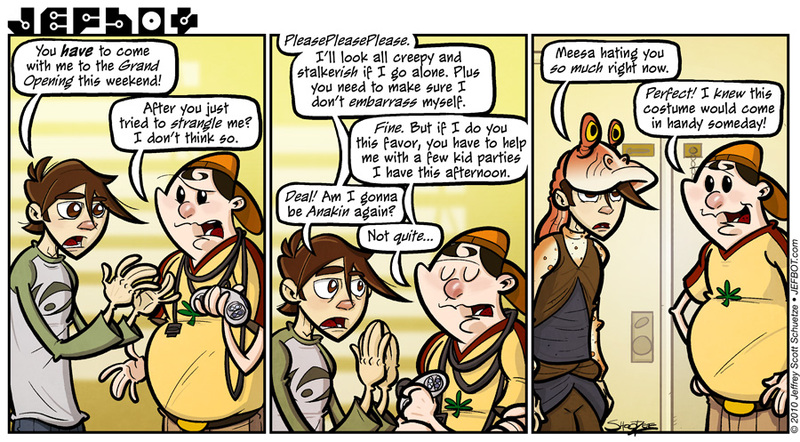 you’ll be happy to know that Jar Jar ends with this strip. we won’t be exploring him any further. at least for now. Jarjar is SO Annoying! My step nephew was just about 12 at the time so of course, he ran around for DAYS afterwords talking like that. I wanted to punch him. Anakin was a whiny little B***H! I was truly offended that they took one of the most memorable villans, A true bada$$ and turned him into a whiny lil Momma’s boy. As far as the story goes, well, I need to finish it first. MASSIVE case of writers block. I know where I want to go just not exactly how to get there. Need to find the file when I get home and will try to post that chapter sometime this weekend. I have to concur with Lord Vader on this one. yeah, the Cornfather got the better deal on this one, Pixie… even if jefbot did try and choke him out. and why do kids like Jar Jar so much!? when i was a kid, i wanted to be Han or Luke – not C3PO or (worse) Wicket! so weird. and i completely agree about Anakin being a “whiny little B***H!” how could Lucas have messed up Vader’s origin so badly? thinking about that little turd “accidentally” joining a space battle then “accidentally” destroying a droid control ship makes me wanna puke. Haha. I hate Jar Jar. Why do children like him? He is so much worse than Ewoks. Brilliant, jefbot!!! i don’t know, Annie! i’m as confused as you are, regarding this. and as much as i hate the Ewoks, yeah, i hate the gungans more. Oh, this strip is made of awesome with a side of awesome sauce. That is the ultimate cruelty the CF is carrying out. As always, the expressions are priceless. I think your being an actor helps you understand how characters’ faces portray emotions. Best of luck to you in Vegas. Here’s hoping you win big! thanks, Shanna! and i do sometimes use the Photo Booth application on my mac to capture expressions so i can use them as reference for the strip, so maybe you’re right on about my acting training informing my JEFbot drawings. and yeah, Luke was totally whiny in Star Wars (or “A New Hope” as Lucas would like us to call it now), but at least he redeems his lameness by the time The Empire Strikes Back starts! boy/teen Anakin just gets more and more whiny throughout the prequels. but you’re right – it all depends on which trilogy you grew up with. and you’re also right in saying that the original trilogy is better. heheh. Silly Jefbot, it’s not creepy and stalkerish if you got an INVITATION! Also, don’t main your mouth again at the buffet. wow, all this luck you guys sent me must’ve helped, cuz i totally came away with some PHAT LOOT from vegas! maybe not enough to take a trip to the UK, but i appreciate the invite! Bugger. I said “main”, I meant “maim”. Gods damn it. Still, I guess it goes to show how much you really like a person, when you’re unable to control all of your “crazy”. Unfortunately, most people don’t think that “crazy” is an attractive quality. I bet the UN loved the Original Trilogy. are you and DJ trying to punk me, Natalie!? i’m lending you the DVDs. Always look on the right side of life! When I saw episode I i was like three or something, and thats how I became the sociopath of today. what bright side!? there is no bright side to Jar Jar, Anime fan. Ironically, I was in the age group that Episodes I, II, and III were targeting, so I actually enjoyed them. I believe that the second Trilogy produced (first three chronologically) were created for the sole purpose of bringing a new generation of fans to enjoy the Star Wars franchise. That’s right, I’m saying that the prequals were crappy because they were aimed specifically at non-fans. Speaking of Star Wars, have you seen the the teasers and such for Force Unleashed II on Xbox Live yet? (Spoiler alert!) I mean, countering a giant robot that shoots lightning by using Force Lightning and taking it down with twin lightsabers to its chest through its neck is totally awesome! your conclusion about the prequels being crappy because they were aimed at non-fans is right on, NeoDarklight. that’s also what made Return of the Jedi the weakest of the original trilogy: it seemed to be unconcerned with story or character, and was content to be a vehicle to create cute toys while rehashing the plot of A New Hope at that point. Oh, and before I forget, how’s the resource acquisition coming along in the experiment, Jeff? i think i may have found a resource for the strawberry Quik! i should find out soon. …looking at the last half of the post, I have to say: You are aware the video ones are rigged, right? Because anything “randomly” generated by a computer is actually based off of a complex algorithm that requires hours of extensive programming because there is no way to make a computer understand the concept of randomness. fighting with game controllers and Jar-jar…. why does this sound familiar? lemme know when it comes to you, likeacupcake. I think we need that controller cord on standby, eh? that was gonna be my comic on the last comic…. deja vu with Jar Jar!? uh-oh. i really am afraid to ask, Leithal. Jar Jar ahhhhhh! get away get away! I grew up with the prequels. Jar Jar *still* annoys me. xD OT ftw. YES! nice to hear you’re in the prequel demographic but still reject Jar Jar, Jaeh. that means there’s still hope for the youth of today. I think this is revenge for more than just being strangled. Can’t wait to see what happens next. One thing I never understood was all the hate for Jar Jar. Seriously people, what is it about him that you hate so much? If it’s because of the way he talks or acts, that’s not a vary good reason. He’s MEANT to be the clueless, dumb luck character used for comic relief. And if you still hate him, then what would YOU have done instead? it has been some time since the Cornfather had some revenge on jefbot, Fijiman, so you may be right. and yeah, it totally goes beyond hating the way Jar Jar talks and acts – although i hate those traits too, since Lucas might as well have put Roger Rabbit in that movie – but it would take too much space to list the reasons here. i think it’s very telling that (although it makes his presence in Episode I even more infuriating!) his role was diminished in Episodes II & III. thank the gods. God, I hated Jar Jar with a passion. It was less his stupid way of talking, or even his cluelessness…it was that after the original Star Wars, Lucas felt that Jar Jar was the early version of Chewy. After all, there ALWAYS has to be an almost-animal sentiant creature/person/thing, and since Han wasn’t there with Chewy glued to his hip, they had to create someone like Jar Jar. I’d rather have someone who can rip arms off when annoyed. BTW: Jeff, I got cast in the Drew Barrymore movie! We start filming in Anchorage on the 15th of next month! First ever film that isn’t a student film, yay! i totally agree with you, Tiana. plus, Chewy was awesome! and didn’t take up as much screen time as Jar Jar, either. and didn’t get his tongue grabbed by a jedi or get his face zapped by electricity or step in poop. ugh. Hey everybody! Back from and AWESOME weekend with couple of my friends! Eddie will elaborate. I wont comment about todays strip ´cause all in Jefbots blog about it is true. hey jb. can u make a downloadable version of the 272 strip with blank bubble. i got a few ideas i want to put down in it and upload to the fanart. i maybe crappy with art but i love writing things. Jar Jar was super annoying, but you’re right about Anakin. He was so whiny! (Waaah Obi-wan is just jealous!) I feel like they wanted us to sympathize with him as he went through he’s transition to evilness, but I was pretty much done with him from the get go(waaah padme didn’t recognize me). yep, i think there are more “groaner” moments for Anakin than Jar Jar for me now, Paprika. i actually feel bad for the actors ‘cuz i don’t know if they could’ve even made that dialogue work. “are you an angel?” “i’m a person and my name is anakin!” “i will be the most powerful jedi ever! i promise you. i will even learn to stop people from dying!” so horrible. yeah, no sympathy here, either. The saddest part of the Jar Jar in the last panel is I know a guy who owns such a costume. Amusingly enough, he defaults to talking like Jar Jar when he gets drunk. This is so cruel it’s funny. I never thought Jar Jar Binks could be this funny.